Beat the egg whites on medium speed until foamy, about 2 minutes. Add cream of tartar and beat another 3 minutes. Slowly add the sugar 1 tablespoon at a time, then beat for 5 minutes or until very stiff and glossy. Add vanilla and beat one more minute. Using 2 spoons, shape into mounds onto the parchment paper. Turn the oven off and leave the meringues in the closed oven for another hour. Do not refrigerate. They will keep for months in a closed container. Jenny, Can you estimate how many calories are in a small meringue? Once I start eating these, I can’t stop!! Thanks for asking. It’s granulated and I clarified the recipe. Hi Jenny, I am an accomplished cook and baker but I’ve never made meringue. I’m scared of it! LOL! I want to try your recipe. It’s the best explained and makes me feel I can make it! I want to double your recipe. Do I just double ALL the ingredients and beating time or is there something else that needs to be done? I will be using the cream of tartar…will that also be doubled using 4 egg whites? I know these sound like trivial questions but they’re important to me…like, using 4 egg whites, do you beat 4 minutes instead of 2…and so on throughout the recipe. Trust me, I’m not trying to be silly. I just want a doubled recipe to turn out perfectly. I love your channel although you haven’t uploaded in a long while, I always seem to find what I’m looking for and I think that’s good planning on your part. I have a feeling that 4 egg whites would be a lot for most mixers and I have never doubled this recipe. Why not try it first as it is because it makes a lot of cookies. These meringues were great! I ate three of them in one minute. Do you have any recommendations if you want them to be strawberry flavored? Thanks! These meringues were great! I ate three of them in one minute. They got sticky after a while. Do you have any ideas why? Thank you for the great recipe! There is much better information on sticky meringues online than I can provide – you can find lots of info with a simple search. Can I sprinkle colored sugar onot top? Yes, you can add food coloring. Thank you so much for this recipe… it works just like you said… my daughter love it so much! Shades of my grandmother’s Pavlova! She never wrote down her recipes so thanks kindly for providing this! I’ve been thinking I’d like to use the recipe for making a Pavlova – can you tell me if the cooking – resting time would need to change? I have only made the small cookies so I can’t answer from experience. It’s best if you can look up some pavlova recipes for the baking time and temperature as it may also depend on the size you are making. Are you aloud to put it in a piping bag and then create it? 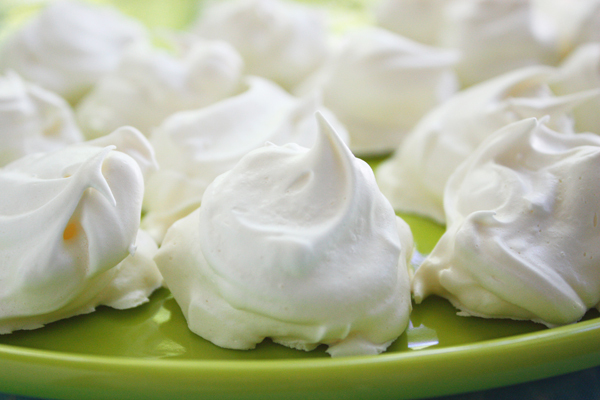 Yes, you can use a piping bag to make meringues. I have made these before and have added 1/2c. Semi-Sweet Mini- Chocolate chips and 1/2 finely chopped pecans. Just made them and they turned out great. However after about half an hour they became very sticky. I saw the comments made and will try to dry them out in the oven for another 10 to 15 minutes as suggested. Thanks a bunch Jenny, you are the best!!!!!!!!!! 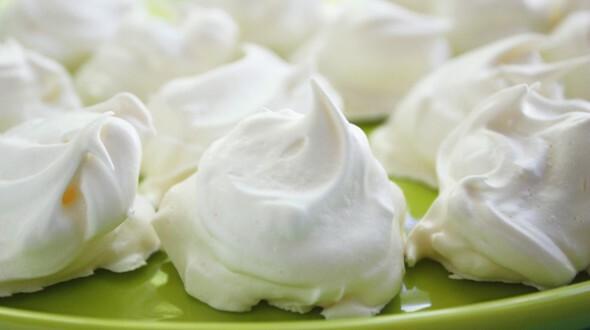 Meringues can become sticky if the weather is humid too. I am wondering if you can make these meringues with brown sugar. Also, is it possible to make chocolate meringues using this recipe. There are recipes for brown sugar meringues but I have never made them. I think you could use my recipe to make chocolate meringues by adding unsweetened powdered cocoa but I’m not sure exactly how much cocoa you would need – no more than two tablespoons for sure. But then you might need a little more sugar. I always say it’s better to use someone else’s proven recipe than to change mine because I can only guarantee my own recipes as written and this is the only meringue that I make. Good luck! By accident I left them in for 2 hours and in the last 30 minuets or so, I took them out and tried one and it tasted sour. Do you have any idea why this may have happened? That’s a bit of a mystery. If you didn’t use parchment paper, it could be the metal from the pan. Or it could be the cream of tartar – maybe it wasn’t fresh or maybe you used too much. All I can think of is to try again using parchment paper and go easy on the cream of tarter or just eliminate it. It’s only there to stabilize the meringues but if you beat the eggs long and hard enough, you can go without the cream of tartar. 1. Are you using a stand mixer or electric hand mixer? 2. How long are you beating the mixture? 3. Are you using parchment paper? 4. What color is your pan? 5. Is your weather naturally humid? 6. Did you add cream of tartar? 7. Is your oven rack in the middle? Please respond and I will do my best to help. Made your meringues, them came out fantastic. I make a batch every Saturday. I have one question. My meringues once they are out of the container for about 5 minutes they get sticky on the top, bad for my grandson he gets all his hands sticky. I live in the northern part of Italy and the weather has been super humid, can that make them sticky? Patrizia, your humidity is definitely the problem. It can be a challenge to make meringues in humid weather. In fact, when it’s raining here, I just avoid making them altogether. But there are a couple of things you could try. One is to increase the cream of tartar to 1/2 teaspoon. Another is to beat them even longer for extremely stiff peaks and make sure you’re not beating them next to a pot of boiling water or moisture from a dishwasher as they will absorb moisture from the air. And finally, you could try leaving them in the closed oven after it’s turned off for a longer time. My recipe says one hour but you could try leaving them in there overnight. Also, when serving, you could dry them out in a 200 degree oven for 10 – 15 minutes. I hope that helps. I just want 2 thank u 4 da meringue recipe…!!! i loved it!! Im actually just 11 years old…believe it or nt. n i just want 2 make a request if u can show the recipe how to make cotton candy wihtout a machine if that is possible. 🙂 God bless! !